So last night while I was browsing about Facebook I came across a post from Princess Cadence of a new pony baby. Not only was the doll adorably cute as they all are. However this one hit home a bit much. SHE LOOKS EXACTLY LIKE CADENCE!!! Pink, purply blonde hair and those adorable accents that makes her an alicorn! 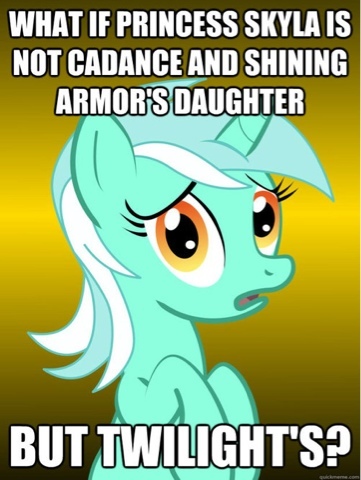 So I immediately thought she was Shining Armor and Cadence's little bundle of epic cuteness. Up until I googled it this morning and everybrony on the net is talking about how she is possibly related to the royal line but no one can figure out how. They went so far to say she's Celestia's baby from some unknown baby daddy colt lol. So we don't know much about this bundle of joy but I can bet that we'll be seeing a lot if her in season four. Now I'm no Apple Family expert but in the midst of looking for all things Princess Skyla, this one popped up and showed a little cute pony just like her, named Apple Sprout. She look familiar and I dismissed it at first. Then OH MY GAWD why did I immediately think she was Big Mac and Fluttershy's baby!!!!! So I googled her and all I found was a few blank flanks that bronies may have honored with a name and then the one that came up was yellow with this carrot top like hair. Hmm.......what will season four bring us?? Last time they showed plenty of Alicorn Twilight merchandise and low and behold we get a new princess. Maybe there will be a big old baby pony boom on the show and the mane six get married or hooked up (hence that little Apple Sprout pony that looks like Flutter but is strong like Big Mac ;D). Well either way lets hope this season is much more exciting than the last :p.